(NaturalNews) Agriculture officials have once again ignored science by suggesting deregulation of two new GMO crops from Monsanto that contain built-in resistance to chemicals derived from the same family as Agent Orange. Roundup Ready 2 Xtend soybeans and Bollgard II XtendFlex cotton are now one step closer to commercial plantings after the U.S. Department of Agriculture (USDA) declared them to be safe and effective in its final Environmental Impact Statement (EIS), released December 12, 2014. Xtend technology represents the latest iteration of Roundup Ready genetically modified organisms (GMOs), a knee-jerk solution, if you will, to chemical-resistant "superweeds" that no longer respond to the original Roundup (primary ingredient: glyphosate) formula. Despite thousands of public comments from farmers, environmental experts and others warning that Xtend technology will only further contaminate the environment and food supply, the USDA sided with Monsanto in recommending their approval. 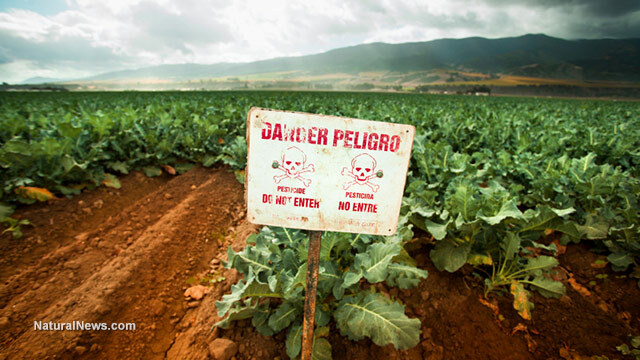 The two crops are resistant to a chemical known as dicamba, which the Pesticide Action Network (PAN) describes as a "close cousin" of 2,4-D, one of the primary active components in the infamous Agent Orange defoliant. These same crops will come stacked with Monsanto's Roundup Ready gene as well, which will allow them to be sprayed with a special "premix" of both dicamba and glyphosate. "Dicamba-tolerant soy and cotton are simply the latest example of USDA's allegiance to the biotechnology industry and dependence upon chemical solutions," reads a statement issued by Food & Water Watch (FWW) Executive Director Wenonah Hauter. "This continues the disturbing trend of more herbicide-tolerant crop approvals taking place under President Obama's watch." This short-sighted approach to weed management only continues the destructive cycle of herbicide overuse and abuse that caused superweeds and "superbugs" to emerge in the first place. Rather than take a step back and evaluate how we got into this mess in the first place -- transgenic monoculture methods are inherently unsustainable -- the USDA has once again decided to turn a blind eye to science and grant its blessing for more chemicals and more pollution. "Once again, the USDA has neglected to look at the full range of impacts associated with these GMO herbicide-tolerant crops," added Hauter. "Instead the agency has opted for a short-term solution to superweeds that have become resistant to herbicides because of previous approvals of GMOs, thereby perpetuating and escalating chemical use." One of the major selling points for GMOs has always been that they will reduce the need for chemical use. But as explained in the USDA's EIS for dicamba-tolerant soybeans and cotton, dicamba use will increase by an astounding 8,800 percent for soybeans and 1,400 percent for cotton. These same crops will also allow for much longer spraying windows throughout the season, threatening other nearby crops as well as people living near the spraying areas. "The USDA has ignored pleas from organic farmers and other specialty crop growers asking the agency not to approve these crops that will increase applications of this incredibly drift-prone herbicide," says FWW. "Farmers of nearby non-tolerant crops will pay the price for USDA's short-term weed management fix in the form of diminished or completely destroyed harvests caused by dicamba drift." Meanwhile, Dow AgroSciences has leapt over one of its major hurdles in gaining approval for 2,4-D-tolerant corn and soybeans. Known as "Enlist," Dow's brand of Agent Orange crops are resistant to both glyphosate and glufosinate, a broad-spectrum herbicide linked to intestinal damage and endocrine disruption.